Doing a "First Look" session at the start of your wedding day is lots of fun. The "First Look” happens at the beginning of the day, when you look your very best, with fresh makeup, great hair and excited smiles on your faces. We set you up so that you sneak up on him (or vice versa) and we capture that special moment when you see each other for the first time. Afterwards, we can do portraits of you two together, and family photos if everyone is ready. Doing a "First Look" really takes takes the pressure off later in the day, and best of all, you’ll have more time to enjoy the guests and the party. The main photographer captures all the major events of the day. The second photographer catches all the funny moments between these moments. So, if candid photography is important to you, a second photographer is essential. I was shooting a wedding a few years ago when I almost missed getting a nice photo of the bride coming down the aisle -- there were just too many people standing in the aisle snapping photos of the bride with their cell phones. I could barely see her, much less get a shot of her. Because everyone has a cell phone today, this is now a huge problem - not just as the bride comes down the aisle, but throughout wedding ceremony. People think nothing of popping up all over the church and running back and fourth -- they just want the perfect shot! But churches are quiet, creaky places. I literally tiptoe around when I'm taking photos in a church, and I move very slowly, so as not to draw attention to myself. I don't want the guests watching me-- I want them focusing on the bride and groom and enjoying the wedding. We really want you to enjoy our wedding ceremony, and feel truly present and in the moment with us. That's why we've hired Monique from Studio Iris to take photos for us, and are respectfully asking that everyone turn their cameras and cell phones off during the wedding ceremony. We want you to sit back, relax, and just enjoy the wedding. Of course, we will happily share our wedding photos with you afterward! You can also ask the priest or minister to remind people that it's an "unplugged wedding," and to tell people put to put away their cameras and cell phones. Try to do your getting ready photos at home, rather than a hotel. Hotel rooms are full of beds, with not a lot of room to move around. There's also usually one window at one end of the room, like a light at the end of a tunnel. It's doable, but not ideal for pictures. Hotel rooms are usually messy on a wedding day, too. There are full of suitcases, shoes, clothes, champagne bottles, food, curling irons, nylons, etc. Again-- it's doable in pictures, but not ideal. I usually end up doing a bit of housekeeping, otherwise the room looks messy in the pictures. The best place for getting ready photos is at your parent’s home. It's usually bigger and fancier than yours, and will look fantastic in photos. People’s homes are also much more personal and intimate than hotel rooms, which makes for better photos. Hire specialists, not generalists. Think about it: when was the last time you had a spectacular meal at a Italian-Canadian Restaurant? Same goes for photography and video. If you want outstanding photography and video, hire people who specialize in that. Sometimes, photographers and video guys don’t get along. Nothing personal, it’s just that they often they want to be in the exactly same spot during the crucial moments of your wedding day (coming down the aisle, the rings going on, the first kiss, etc.). At best, this can lead to heated disputes and arm waving between the video guy and the photographer at inopportune moments. At worst, it can mean you don't get complete coverage of your wedding, either because the video guy was blocking the photographer's way, or the other way around. So, ask your photographer if they can recommend a good videographer, and vice versa. Personally, I recommend Elie, from Focus Video. Elie is a cool, calm presence on the wedding day, and we never get in each other's way-- which means better photography and video for you. Photographers are usually a great source for videographer referrals-- and lots of other wedding vendors as well. I’ve been a wedding photographer for over 15 years, and have literally hundreds of contacts in the industry. I only refer one vendor per specialty, though. I don't get a commission for recommending these vendors-- nor do I charge them to appear on my website. I recommend them because they are among the best wedding vendors in Montreal (I can personally vouch for their professionalism) and they help me do my job better-- which, in the end, means better wedding photographs for you. For example, there's Serafino Graziosi, from On the beat Events. He and I communicate all night long. He tells me what's coming up and when so I never miss a photograph. There's Martine from Makeup Box, whose makeup is so lovely, light and natural looking, it looks simply incredible in photographs. There's my favourite classical trio, Trio Amore. These guys are great musicians, but that's not why I like them. I like them they don't leave their music cases and belongings strewn about, which looks bad in photos. Your wedding photographer should be a friendly person with great people skills. You want someone who can charm reluctant grooms into doing romantic photos, make high maintenance mother-in-laws laugh, and cajole shy children into smiling for the camera. You also want to like your photographer as a person. This person will be at your side for 12-14 hours on your wedding day. You don't want someone who's uninterested, bored or possibly even arrogant. It will ruin your day. "Monique was so positive, relaxed and patient, everybody loved her! I didn't have to worry about a thing as Monique knew exactly what she was doing. She was also very discrete during the ceremony and captured some really breathtaking shots." You know what most people put in their wedding albums? After photos of the bride and groom, it's family photos! 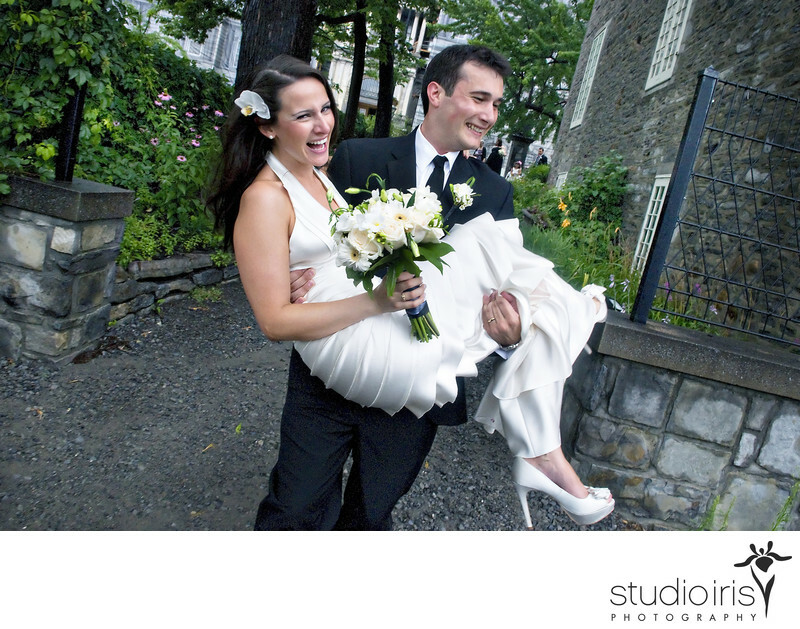 It varies from couple to couple, but most wedding albums are at least 25% family photos. So, choose a photographer who does great family photos, and make sure to set aside enough time in the day to take these important photos. But the reality is, most people never do anything with their wedding photos. They get busy, and just never get around to it. Most people never even print up any photos. My parents were married over 50 years ago, at a small country church in rural Ontario. I look at their wedding pictures all the time. It’s a record of my family, frozen in time. I love looking at the photos of my grandparents. My aunts and uncles. My parents, so young and hopeful. I pour over my own wedding photos as well. My husband with a startled look on his face as I come down the aisle, as if he can’t believe we’re actually getting married. Our tiny son, only 18 months old, decked out in a vest and bowtie. My sister in a very, very, very red dress. Your wedding album is the only thing you have left when the wedding is over. You will enjoy it as a reminder your wedding, and later, your family will treasure it for generations.